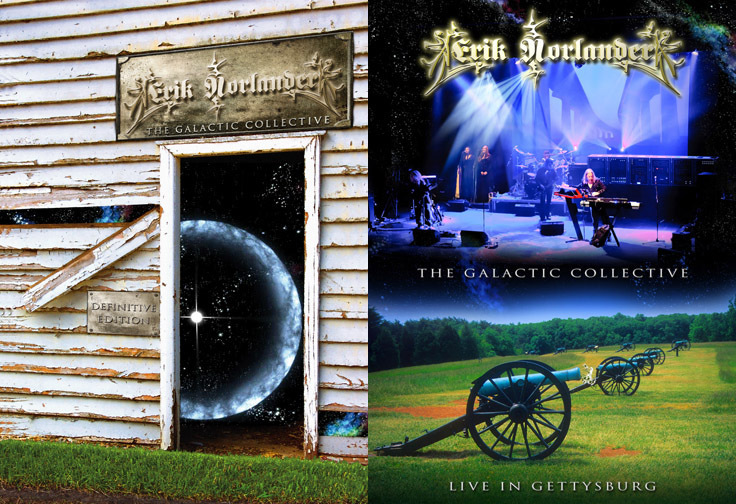 Two Deluxe Multimedia Releases from Erik Norlander and The Galactic Collective Now Available! June 12, 2012 – El Dorado Hills, CA – The official release date for the DVD/CD sets, Erik Norlander – The Galactive Collective “Definitive Edition” and “Live in Gettysburg,” is August 6th, 2012 when the titles will be available at retailers worldwide, but you can get them NOW from Gonzo Multimedia in the UK and on June 21st from Think Tank Media in the USA. In 2009, master keyboardist, Erik Norlander, went into the studio with a new set of virtuoso musicians to record re-imaginings of his favorite instrumental compositions as a project called “The Galactic Collective.” In 2010, Erik released a preview of the project on CD-R through Chian Productions in Ohio. In 2011, Erik took the project on the road and recorded the results. Now in 2012, we finally have the complete document of Erik’s massive undertaking in two remarkable releases, one in studio, the other on stage. Each title includes a video DVD and two audio CDs released by Erik’s company, Think Tank Media, in partnership with UK prog giant, Gonzo Multimedia. All discs are replicated — not CD-R or DVD-R — and each contains deluxe, full-color 5×7″ booklets with extensive liner notes written by those directly involved with the project. The long-awaited DVD/2CD studio release from symphonic rock keyboard master, Erik Norlander, is now here. THE GALACTIC COLLECTIVE is a brand new take on the best of Erik’s vast instrumental compositions written for Rocket Scientists, Lana Lane and his own solo albums over the years. Recorded on an amazing arsenal of classic analog synthesizers (including 6 Moog instruments), Hammond organ and an incredible Steinway model B grand piano at Cleveland Ohio’s prestigious Magnetic North Studio with engineer Chris Keffer and executive producer Dena Henry along with bassist Mark Matthews, drummer Nick LePar and choral vocal sections by Lana Lane and John Payne along with a suite of guest guitarists including John Payne, Mitch Perry, Mark McCrite, Ron Redfield and Freddy DeMarco, THE GALACTIC COLLECTIVE is a must have for all fans of keyboard – oriented instrumental progressive rock. The DVD and 2CD set includes the complete album, ERIK NORLANDER – THE GALACTIC COLLECTIVE, both on CD and DVD with the complete in-studio video shot during the actual sessions (as seen on YouTube). The DVD includes extensive interview footage of Erik discussing each song, its conception and new interpretation for this project. A second disc of well-crafted (not filler!) unreleased alternate versions and a new recording of Erik’s classic arrangement of “Space: 1999” makes up the second CD as Echoes from the Collective. Full color, detailed booklet with liner notes by Michelle Moog, Executive Director of The Bob Moog Foundation and daughter of maverick synthesizer pioneer and inventor, Robert Moog. First came the studio version, now here is the live version! The DVD and 2CD set includes the complete album, ERIK NORLANDER – THE GALACTIC COLLECTIVE, performed LIVE at The Rites of Spring Festival 2011 along with the “Into the Sunset Suite” and the Norlander-penned Lana Lane songs, “Capture the Sun” and “Secrets of Astrology” creatively woven into medleys to complete the celestial sojourn with guest vocals by none other than Lana Lane herself! Erik’s Modular Moog synthesizer, “The Wall of Doom,” was used extensively at this concert, and band is introduced with an excellent and informative monologue from Michelle Moog, Executive Director of The Bob Moog Foundation and daughter of the late maverick synthesizer pioneer and inventor, Robert Moog. Full color, detailed booklet includes not only beautiful photos from the concert but also liner notes by Erik’s synth tech, former Moog Music designer and ELP keyboard tech, August Worley, along with an additional article written by Erik himself especially for this release. LIVE IN GETTYSBURG is the inevitable companion to its partner release, THE GALACTIC COLLECTIVE – DEFINITIVE EDITION, that contains the complete studio recordings along with extensive video interviews.